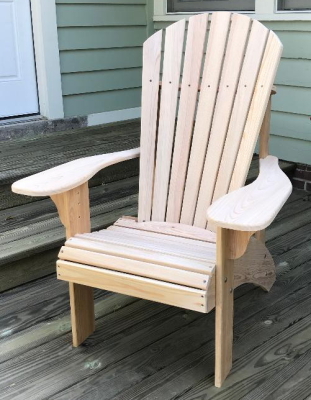 Hi Phil....I just finished my first Grandpa chair. As you said I like it so much. Very comfortable as well. I wish not all the Grandpas will rush to me to get one ?? Thanks again for the nice plans and good ideas. Wish you a very pleasant Easter time. By the way, I received some Douglas pine to fit the finish of my Kota sauna. The result is not bad. Guenther Zimmer, France. Wednesday, January 16, 2019, 9:35:00 P.M.
Made the Grandpa chair according to plan, and it has turned out great. Extremely comfortable! Great design, easy to follow instructions.The plans and instruction for the Beach Chair were great. Even more so is the comfort of the finished chair. The current family discussion is now how many of these I need to make! Out of interest, these are built out of acajou, one of the African mahogany species (Khaya Iivorensis). They will not be treated, and will weather to a grey/silver as will the decking they are on. Well done, Phil ! Hello there! Happy day in my life. I am proud to present to you my works. I did a little changes to make it larger. By the way your patterns are the best. 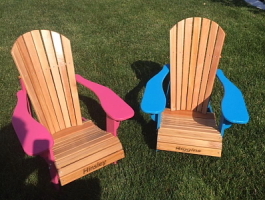 I made my grand daughters their chairs and just completed a couple for a friend grand kids. The painted ones were for my friend. She bought the paint and I imprinted the names. Hello Phil. Not so long time ago we made small business with plans for three plans. Do you remember ? My interest about wood plans of your products continue. 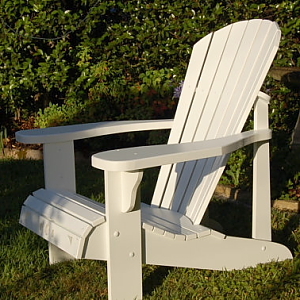 I have made Grandpa, Family bench, Muskoka chair and now I will try assemble next nice models : Beach chair, Footstool, Table, Folding Muskoka in digital versions for CNC. Hi Phil, Here's my first set of the arm chairs. Really like the design. Thanks for a great design and instructions. 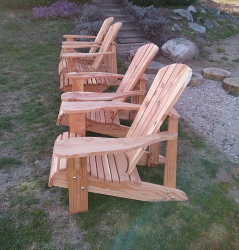 These are made of full 1" clear Western Red Cedar. I'll be finishing them with a clear penetrating oil in the next few days. Hello Phil, I attach photo of my effort.There are some slight variations but all parts fitted well. My mantra was 'all recycled timber’. The slats etc were Oregon I think in Canada its called Douglas Fir, and the rockers are Cypress pine from under my sons kitchen when he renovated. It has had a test rock by my grand daughter. Thank for the excellent instructions, John Dymock, Australia. Arm Chair...Hey Phil. I finished my first one of your new design. I thought I would share photos. Your design was very simple to cut and had no issues using the Vcarve tile function to cut longer piece. I think the next version I'm going to increase the size a little. I'm a big boy of 250lbs and fit but would like a little more room. Shouldn't be hard to do. I love the design and very happy with the results. I'm going to buy some more of your designs. 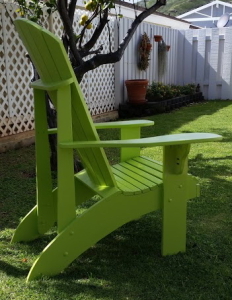 Aloha Phil, here's pics of two of your beautiful grandfather chairs I made. I did everything with just circular saw, jigsaw, drill, and sander. All stainless steel hardware (I'm less than a mile from coastline). And my wife and I are going to be grandparents! 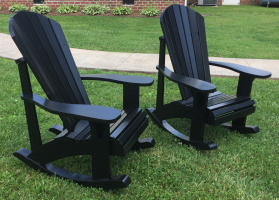 Had a great time this weekend building these from your great Grandpa chair plans. Love the way they sit. The plans were easy to follow Thanks! 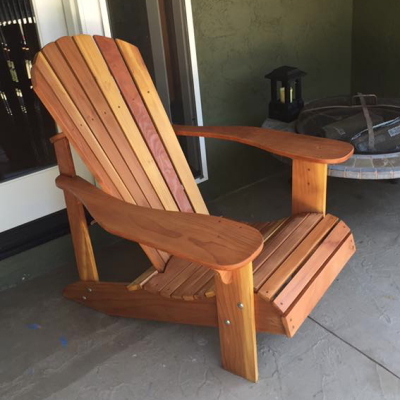 I just finished the Grandpa chair this past week. So far, my favorite is the Grandpa. I love how the chair looks and feels. 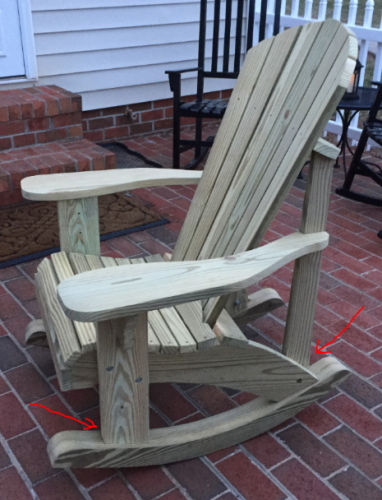 Thanks to these easy to read plans, building our Grandpa Adirondack chairs was a breeze! Thanks so much! amylouproductions sent you a conversation on January 17, 2018 on Etsy. The second set of DWG files worked out great! We built 1 double and 2 single chairs. Thanks for your help! Hi Phil ... 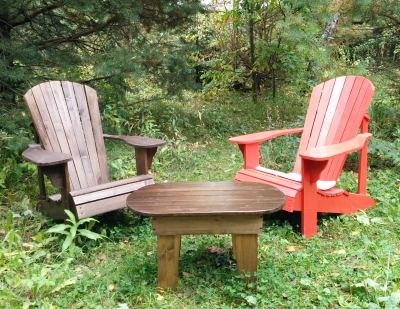 I have attached a picture of my attempt on making these fantastic chairs. The templates and instructions are 1st class and so easy to follow. 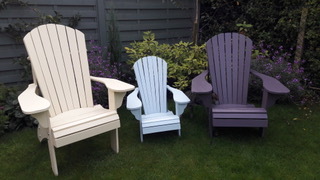 I have now to date made 3 Children's chairs for the Grand children - 2 Grandad - 1 Adult with 2 more in the process of being built. 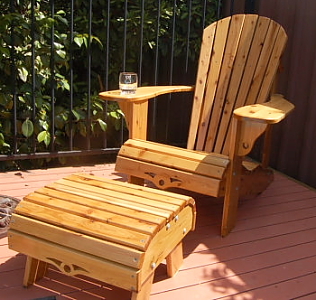 Also I want to build a couple of Foot Stools over the winter for next summer. #1 came out pretty well. I found I had to buy 1 X 10 stock for part A, the main part that is the rear foot. #2 is almost done. Thank you! My dad and I just finished the smallest chair for my daughter (~6mo). She loves it! The plans were so easy to follow! We did make one little change - we didn't screw the arm pieces through the arm, but put dowels in and glued them (she has a tendency to pick at things). Also to be noted this was my first woodworking project with no prior experience!!! She absolutely loves it and we had so much fun building it! Now my husband wants his own! Thanks again! Phil....I finally finished all the chairs. What do you think? All my friends and family love them. Let me explain some things. I am a teacher on Staatl. Berufsschule Berchtesgadener Land (www.bsbgl.de). We produced the ROCKER and the BEACH CHAIR. My students begun their education in September last year. 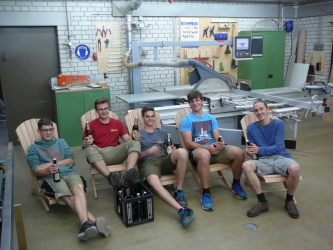 The last projekt for this year was to produce outdoor furniture. I think they did a great job. I can tell you for sure that we produce it for your own. We do not sell the furniture. Have fun with the pictures. Best wishes. NOTE: the content of the PDF's are in German, but the CNC process images are excellent. Excellent drawings, as a result, a great product! It's not just a chair. It brings a smile in children and adults. I finally finished my second chair and got my chairs painted. I wasn't brave enough to deviate from your design on my second chair to adjust how the chair sits, maybe next time...if there is a next time :) At any rate, they turned out great. Check'em out! Phil....Thank you for the plans, I look forward to building a bunch of these for my fire-pit. I'm working on the second chair this week so hopefully I can send you some pics this weekend. Forgot I took this photo. I'm building a total of eight chairs over the summer. 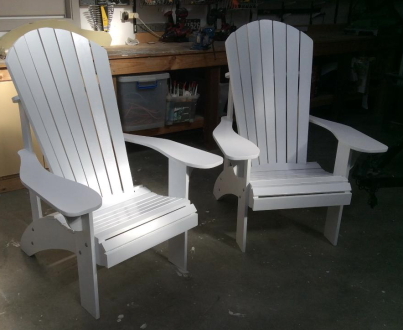 These first two chairs are going to painted in tropical colors. My friends love the chair by the way. It's beautiful....I used 1/2" red cedar stock and discovered how much more precise I had to be than using 3/4" stock. I felt putting the arms on in the sequence you suggested would interfere with the rest of the assembly and I think I was right. I'm going to bring it to New Orleans to give to my grandson so I will be disassembling it and reassemble when I get there and glue every piece and re-screw it all. I think it will last a lot longer if I glue & screw. Also I used 1 1/2" x 6 brass screws, not 1". Hope you are enjoying your vacation. The youth plans were great. No adjustment needed. 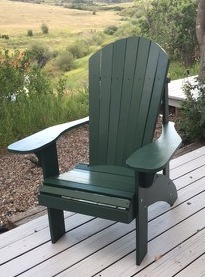 I just finished my first chair and couldn't be happier with the results of the actual construction. I was curious though if it's possible to make the chair more angled to the back? So for example, if my wife were to pick up her feet and cross her legs while sitting, the current configuration makes the chair fall forward. I did re-read your guide and see where it clearly states it's designed so you can rock with your feet flat on the ground. Would adjusting the angles of the bottoms of the front and back legs accomplish what I'm asking? Thanks again for your time! Hey Jay....chair looks really good ! Yes, I think if you if you shortened the back supports and back ends of the side panels, then matched the angle to the front legs, that should work. Send me another pick when you are done. Thanks Phil :) I also ended up making the entire chair 1" thick instead of 3/4". I planed down 2x10's to get the thickness. My gosh was that a long, tedious process! Next time I think I'll try the 5/4 board. 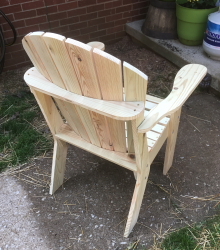 I may try the different angles on the next chair. I planned on making two this whole time but only started with one in case I screwed something up. First chair I've ever built! I am little proud of myself. 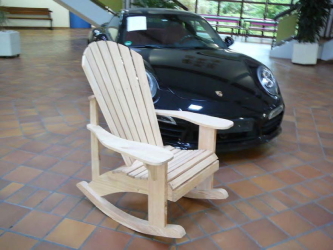 I bought your adirondack chair plans quite a while back. The good news is that I finished one - my first project ever! And it is beautiful and comfortable to sit in......I'm almost ready to assemble the second. Thanks! Thank you so much for the plans. My customer had found a picture and hoped I could make it wider and stronger to fit his 325lb, 6ft 4 build. 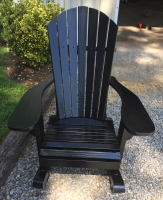 I made the chairs 23" across, using 4 quarter redwood on the seat slats and arm rests, added a stemmed glass holder to the arm. I enlarged and modified the foot rest so the legs both fold into each other for flat storage. Normally I can look at a picture and figure it out over time, but using your plans sure saved time! Thank you for providing the plans. Attached is a picture of the grandpa chairs and foot rests. 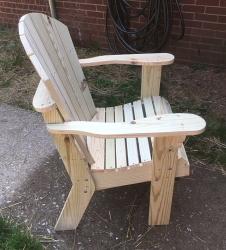 Made a few Adirondack grandpa chairs using your plans....worked out very well. Wanted to share an image with you of my first completed chair. Had a great time making this with my CNC. Cant wait to start my second. Here they are as promised. This project is the latest from your patterns Phil. 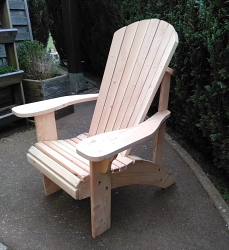 Have a look at what I've been doing in the UK with your chair plans. You're absolutely right about the Grandad chair, that seems to be what people want. You have a great product for guys like me who are trying to start up a new business and bring a little bit of Canada to the UK. 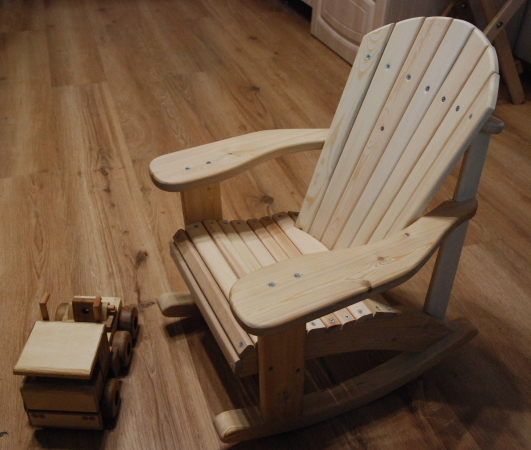 My next project is the rocking chair, I ordered the templates and plans from you on E-bay. Hello. 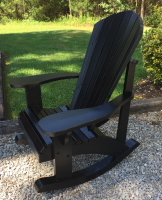 I purchased your templates a while back.Have a look at my version of your standard Adirondack. 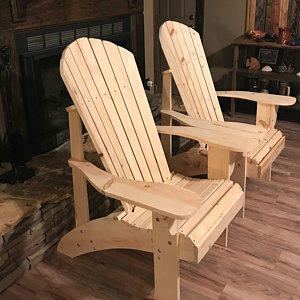 I used your plans to build these chairs for family Members. I designed a different style table. 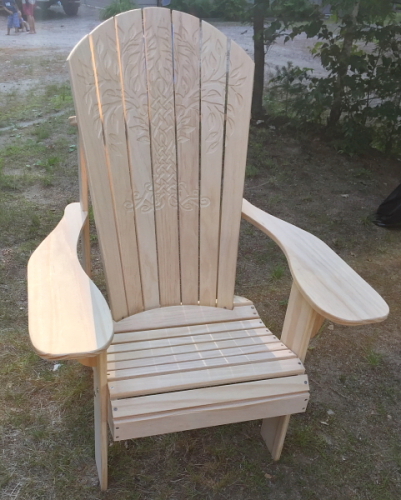 As promised I am attaching some pictures from my Adirondack Chair project. 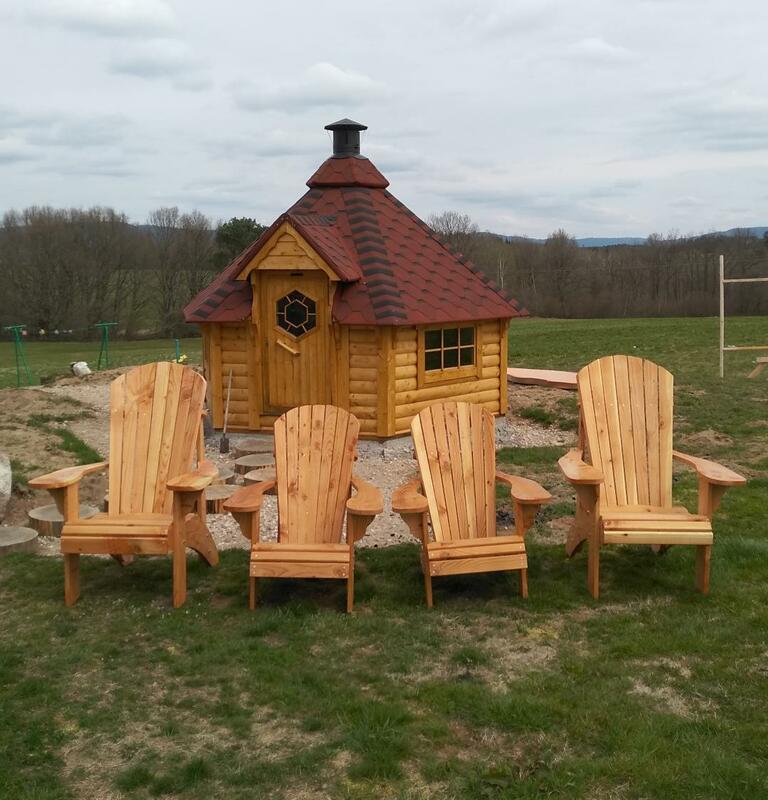 I built 2 adult and 1 youth Adirondack Chairs for my daughter, son-in-law and grandson. My daughter will getting hers in March as a birthday present. The others will get there’s at the same time but as an early birthday present. While I was at it I decided to make 2 footstools to go with the adult chairs and a table to go with the youth chair to complete the overall ensemble. The complete Package of Digital Plans (Item # BH-O-025) I purchased worked out terrific. I had the full size plans printed out at a local print shop and then used the templates to cut out all of the pieces. I had piles of pieces stacked up all over the cellar floor. Thought that I would never get the job done but I was diligent in my efforts. 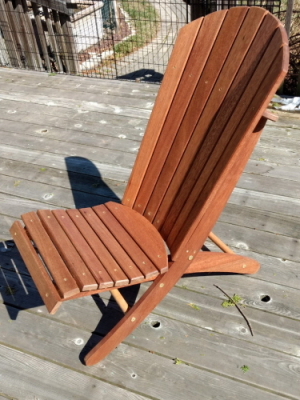 I elected to use pressure treated wood and it worked out well for my first Adirondack Chair build. I slightly modified your plans to include a brace across the bottom of the chair rails to stiffen up the frame and aid in assembly. I also elected to dowel and pocket screw the chair arms into the braces and legs. Additionally I used pocket screws to fasten down all of the chair seat slat boards, table top boards and footstool boards to eliminate any visible screws. Everything came out terrific and I’m extremely pleased with the purchase of these plans. 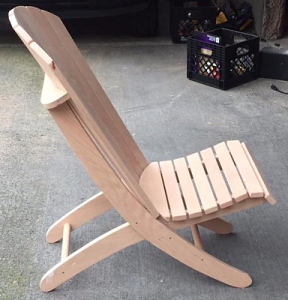 I’m now looking forward to completing a set of Grandpa Adirondack Chairs unless my other daughter sees what I just made her sister and preempts my build schedule and priorities. Just wanted to drop you a quick line saying I finally was able to build a couple of chairs the hard way (using only a band saw and belt sander). I did a write-up on it for my website: http://www.midnight-maker.com . After having done it the hard way, I can't wait to cut them out with a CNC. I took one to work and got orders for 6 of them ! Thanks again and I'll keep you updated on any new developments. 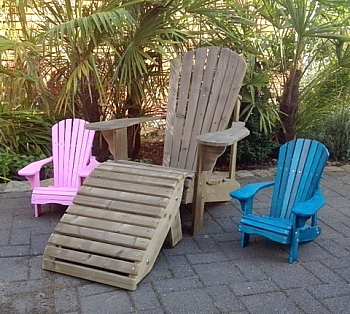 I’m sending you a few photos from yesterday’s routing of the beach chair templates. If it is at all possible could you give our program here at the High School a credit and / or link on your site? The kids would be very appreciative. If you like these, we will be cutting the Muskoka templates this afternoon. 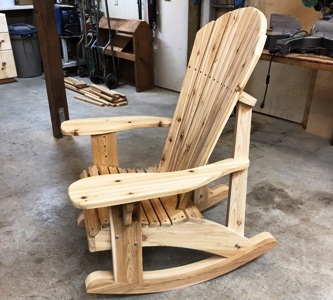 There are quite a few of the chairs being built this semester and I can send some pics of the completed chairs if you like. 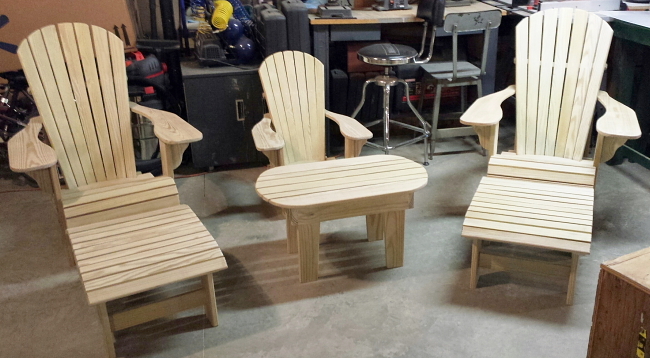 As you should be able to tell from these pictures, students have made a LOT of your chairs over the years. On average, there are around 2 dozen of them built every school year. 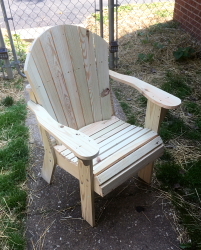 You can see in the image of the poplar chair that a student designed their own ottoman for it. Hello Phil, here is a pic of my two chairs and a table finally. I have painted one in red as per my wife's request and stained the second one and the table for myself ;-) Thanks so much again for your plans! 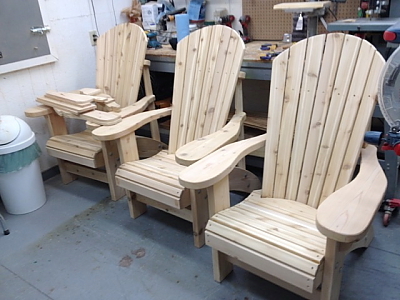 Phil- here's pictures of the finished grandpa chairs. Already friends are trying to place orders.... Looking forward to getting the footstool plans. Mr. 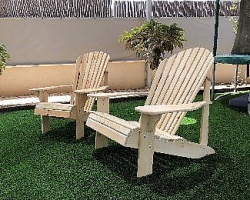 Barley, I just wanted to add my comments to all the others on how well designed the chairs and the plans were. 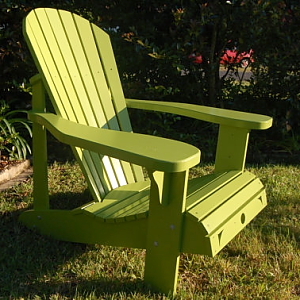 A wonderful project to do, and extremely comfortable chairs. My guests have all commented on how they like the more upright sitting position, especially for ease of snacking and chatting. The four I made (of cypress, with an added table) have become the focal point of our patio. Thanks. 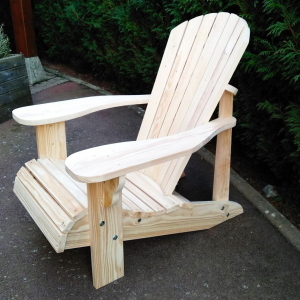 Dear Phil, I've just built my first chair and wanted to share my excitement with you. 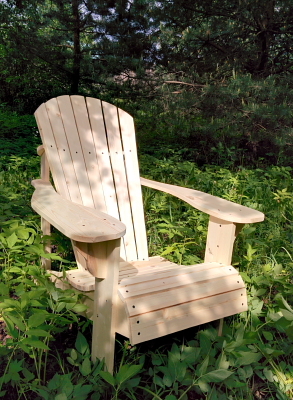 Thanks so much for this fantastic downloadable Adirondack plan, it went smooth right from the start. 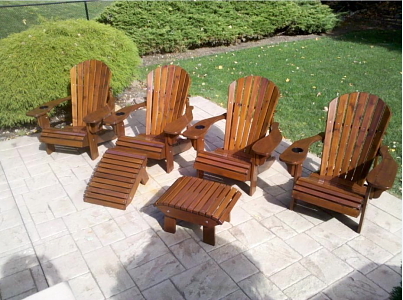 It's the best one I could find on the web and I can't wait to build my next chairs. All my friends just love it since it's not available over here as you can imagine... All the best for you ! My best regards from Moscow, Russia. 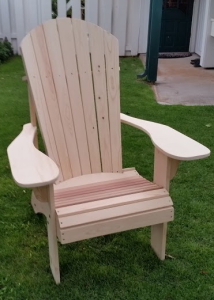 I ordered your plans for the Grandpa Adirondack chair last year and built 2, for my wife and me. 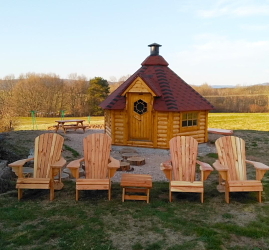 I built them as a winter project and painted them in the spring. I made them out of pine (to keep cost down) and primed and painted them with two coats of an acrylic enamel paint. Brought them up to our seasonal campsite and placed them by the fire pit. We both them. Thought you might like to see them. 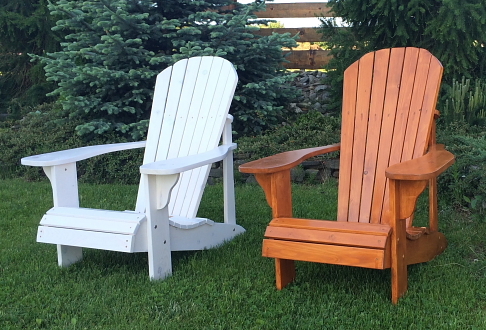 Phil, these are a few of the Adirondack Grandpa chairs we have made. 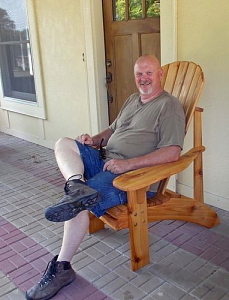 We've sold several and have orders for a love seat and some of your footstool/end stands. (We just ordered that plan). We've had so many compliments from the buyers on the comfort of the chairs. Thanks so much for improving the design!!! I love making the chairs and the plans are just great. After making 7 or 8 of them I have tweaked the design just a bit. We sell them at markets here in the Blue Mountains and people love them. I try to make each one unique by the addition of different cut outs each time. I'm disappointed that over here you can buy cheap pine replicas, that last no time at all. Nothing like the ones I make. 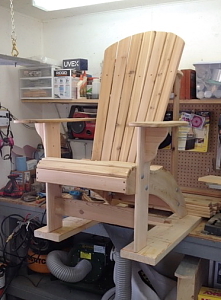 Just wanted to pass on a couple of pics of your chair plan to you, that I have built. Not professional but it has kept me busy! 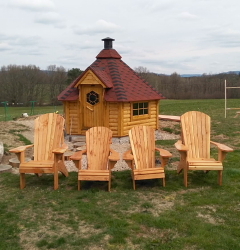 The 3 on the left are additions to the one I built last fall for my gazebo. 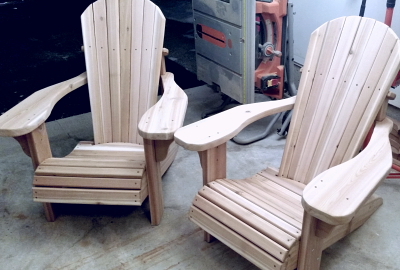 They are made out of heavier stock (Cedar) The one on the right is the same chair built from a thinner stock but I added a couple of braces on the legs. 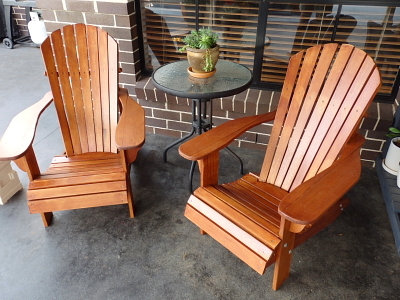 They are Beautiful Chairs Phil and are very comfortable and easy to get in and out of ! One of the best plans I have ordered so far! Thanks! Made my first chair out of your plans. It came out great! I used native, white pine. I was very impressed with the accuracy of your full size templates. The chair sits really comfortably and is easy to exit with the high height. Already cutting out the second chair for a matched pair. Greetings from Robertson, Australia. 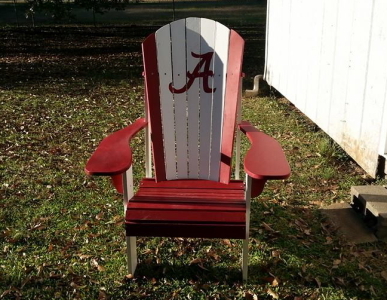 Here's a couple of pics of the two chairs that I finished just before Christmas. I'm really happy with the result. They look great and are nice and comfy. Thanks Phil and all the best for the New Year. 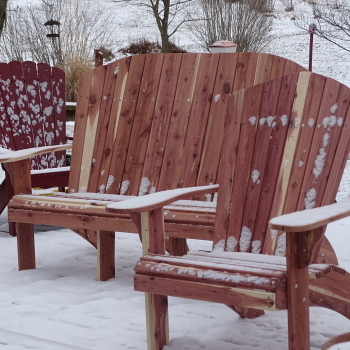 Just wanted to show you my finished Grandpa Adirondack chairs and tables. 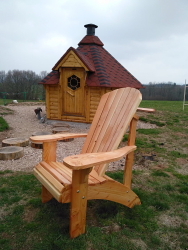 I have suggested to my woodworking friends on various sites to get your plans. I hope they have !! Just wanted to say thank you for the plans & answers during the project. 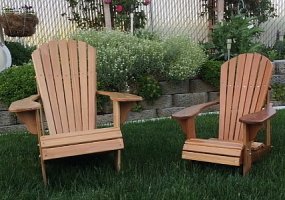 CLICK HERE for a complete step by step construction process of Jeff's widened Folding Chairs. 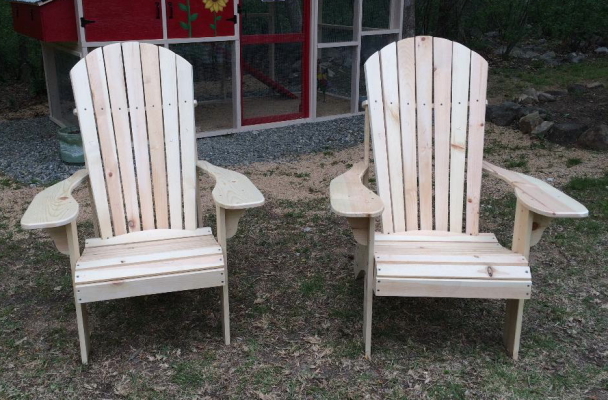 The first two Adrondack chairs for kids are made/built as you can see on the photos. 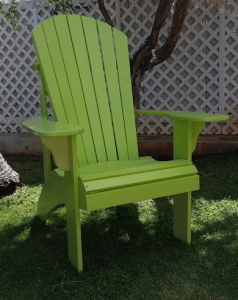 Almost all the people have seen the chairs asking me to build chairs like these for them. Hi Phil. I am still making chairs and enjoying giving them away. 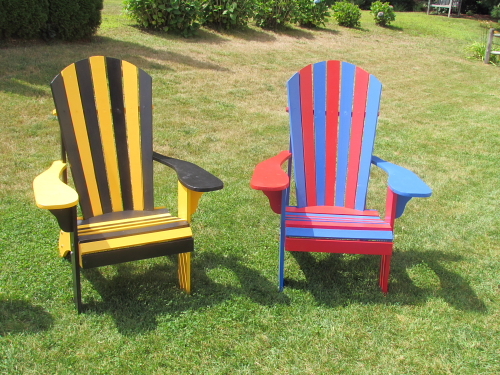 I painted one Grandpa chair the team colors for the Boston Bruins and another for the New York Rangers hockey teams for my sons...they look great side by side! Thanks Phil.